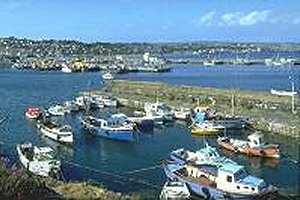 Newlyn is the heart of the Cornish fishing industry, a busy, modern port that is still one of the most successful in England. Its pride is its harbour, built during the 1880's, to which was added a further modern pier in 1980. The harbour encloses an area of 40 acres and includes the Ordnance Tidal Observatory from which is derived the datum for all Ordnance Survey maps in the British Isles. Newlyn supports nearly hundred and fifty boats of all types, which supply its lively market with a variety of quality fish. Approximately 90% of the fish landed are exported, mainly to France and Spain. Current landings value its annual catch at £20-25 million, making Newlyn one of the largest ports by value in the United Kingdom. The Fishing industry is a major economic resource that drives much of the Penzance and district economy. It is estimated that for each person working the boats at sea, a further six persons are employed in associated industries on shore.